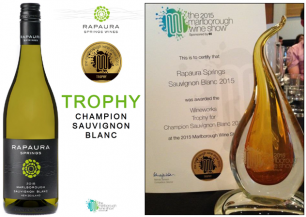 Rapaura Springs have been awarded the Wineworks Trophy and Champion Sauvignon Blanc title at the Marlborough Wine Show! Rapaura Springs is located in Marlborough, New Zealand’s most well known wine region. Marlborough’s land, climate and water do the hard work at Rapaura Springs, leaving the vineyards to tell their own story with just a little nudge in the right direction from experienced winemaking teams in the state of the art Rapaura Springs Winery. The result is a series of exceptional wines with distinct flavours that reflect the iconic Marlborough Terroir. Rapaura Springs Sauvignon Blanc is luscious, fresh and bursting with tropical fruits and characteristic Sauvignon Blanc herbaciousness. It is the perfect complement to a range of dishes from Goat’s Cheese to Ceviche. Contact Christine to find out more about this award winning Sauvignon Blanc.